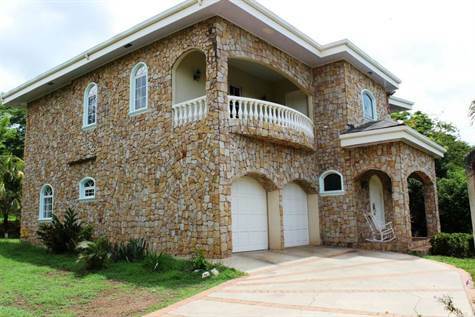 Come see this beautiful and well built home, located in a very private and peaceful neighborhood, within close access to amazing beaches, and useful conveniences, yet away from it all. The house is has very nice landscaping and is beautifully decorated on the outside with Molejon rocks and a traditional composition roof. Equipped with centralized air-conditioning throughout, separate units for each level. The home opens up to a large welcoming entry way and staircase. Each living area offers high beveled ceilings and are separated by lovely large archways. There is a well appointed modern kitchen with high coffered ceilings, stylish granite counters, imported traditional wood cabinets, dishwasher, garbage, disposal, built in oven, and microwave, plus a stainless steal refrigerator. Everything you'd typically see in a modern day Beverly Hills home. The house offers a formal dinning room as well as an eat up breakfast bar. An expansive living room, as well as an extended living area on the second floor balcony complete with wet bar. Great for entertaining. Bedroom 1 has private bath and large built in closets. Bedroom 2 is upstairs and has a spacious walk through closet and a lovely and grand private bathroom. This bedroom also offers lovely views to the golf course greens through the large bay window. Bedroom 3 is the master suite, and is well suited with his and her closets, his and her vanities with separate sinks, a Jacuzzi tub and a private balcony over looking the pasture (golf green) and tropical paradise. The property is being sold with 3 extra building pads already cut and ready to build more fabulous residences, perfect for a little retirement community, rental income residences, or resale. The property is complete with high speed cable and internet already connected. It has public water in addition to a private water well. This is surely a great value and a wise investment! The seller will carry financing too! Call us today for more information or to set up a showing.